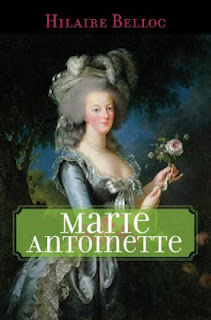 Marie Antoinette by Hilaire Belloc is not your usual biography. The author isn’t interested in sharing anecdotes and discussing the daily life of this unfortunate queen, nor does he tries to understand her personality. Instead, this is a study of the world in which Marie Antoinette lived and the circumstances that connived to bring her to her tragic fate. Marie Antoinette was a good and generous woman, but not a remarkable one. What’s remarkable is the harrowing way in which she suffered during the French Revolution. Belloc believes that it was unavoidable. In this book, he shows how all the obstacles that stood in the way of the young archduchess marrying the dauphin of France fell down one after another, as if they were pushed down by a higher hand, and how all the different events and circumstances of her life in France drew her a step closer to the scaffold. Belloc believes that, because Marie Antoinette didn’t understand the French (not to mention the poor education she had received), she had no choice but to act the way she did, and that led her to her fall. There was just no other destiny for her. I’m not sure I believe Marie Antoinette couldn’t choose to act in any other way, but I do agree that in order for her to do that, she needed to understand her people, which was very difficult to do for her, secluded as she was in the Palace of Versailles and the other royal residencies. But Belloc doesn’t try to justify Marie Antoinette’s behaviour, nor does he accuse her. Simply, he uses historical evidence to set the record straight about the lies and myths that surround the French Queen and point out the truth. He’s not blind to Marie Antoinette’s faults but he doesn’t exaggerate them either. However, this focus on political and social events rather than on Marie Antoinette as a woman, makes the book dense and, at times, hard-to-follow for modern readers. It doesn’t help that Belloc often doesn’t go into details, but simply mentions events and names, giving for granted the reader knows what he’s talking about. This may have been true in 1909, when he wrote the book and the French Revolution was still a very popular subject, but it isn’t today. If you’re not familiar with this time period (and the one in which the author lived as he sometimes mentions more recent events too), you may find the book quite confusing. If that’s the case, you may want to read other books about the subject (Marie Antoinette: The Journey by Antonia Fraser would be a better starting point for anyone interested in the life of the French Queen) and then get back to this one. Then, despite the archaic and convoluted writing style, you’ll find it an engrossing read. Marie Antoinette by Hilaire Belloc is an informative, unbiased and objective work on Marie Antoinette. But rather than focusing on her private life or her personality, the author explains the world in which Marie Antoinette was born in and why she acted the way she did, which lead her to her inevitable fall. Marie Antoinette wasn’t a remarkable woman. The revolution made her remarkable. This book will give you a better understanding of how that happened. However, it is written in an archaic style and the author often cities facts that may not be known to those who aren’t familiar with this time period.